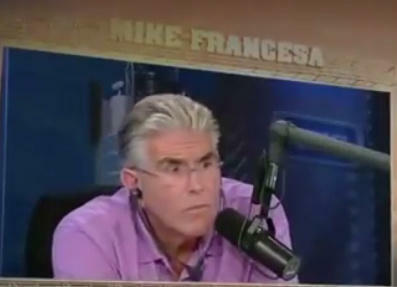 Poor Mike Francesa. It’s been a rough road ever since he began his national Fox Sports 1 simulcast of his WFAN radio show back in February. Over the past three months, his show has been shuffled back and forth between Fox Sports 1 and Fox Sports 2 and sometimes, off both channels due to pre-emptions. He’s found his show pre-empted by MLB, NASCAR, Supercross, European soccer games and in rare cases, breaking news. In each case, the audience watching the programming that replaces him does better than his show. Francesa tells Newsday’s Neil Best that he’s frustrated by all of the pre-emptions and “We’ve been pre-empted far more than I ever thought possible.” Despite that, Francesa says Fox has told him that it’s happy with his show and there have been several meetings to find ways to alleviate the situation. When Francesa was on YES, the only pre-emptions were for New York Yankees games. Now he’s found his show removed for everything from the Europa League to the Craftsman Truck Series that prevents him from gaining traction on FS1. And when he’s shuffled to FS2, his small audience dwindles even more as the channel is not as widely distributed as FS1. In New York, Fox Sports 1 is available in 5 million homes while Fox Sports 2 is in about 2.3 million, but is expected to reach 3 million in the next few months. Francesa says, “All I’m thinking about is trying to work out a solution on Fox. My concerns are not monetary. My concerns are not ratings, either locally or nationally. One issue is that it appears Francesa’s representatives did not thoroughly vet Fox Sports 1’s programming before signing with the channel. He appeared surprised over the number of pre-emptions and how that programming would do better than his show. The real solution here is for Francesa to leave Fox Sports 1 and have his show picked up by MSG Network in New York where he would get his cake and ice cream too. MSG does not have baseball and can air his show straight through without shuffling it to its overflow channels (MSG has as many as three overflow channels depending on its winter sports schedule). It would also be a much better fit for Francesa as his local New York sports talk radio show has yet to resonate with a national audience. Expect some form of resolution over the next few months. Now if the Francesa show gets pre-empted by something like darts or billiards in the future, we might see his head explode and that would be something to watch. Pingback: Mike Francesa reportedly "desperately wants to get back on the radio"